Offering you a complete choice of products which include belleville washer and industrial disc springs. Belleville Springs are conical shaped angular discs, that are loaded in direction of its axises. We bring these superior quality disc springs, procured by employing the latest technology, high grade machines and reliable raw materials. We are industry's leading Manufacturer and Exporter of Belleville Springs. Belleville springs are specifically used to solve many engineering problems like vibration, differential thermal expansion, relaxation, and bolt creep. These are designed and developed as per customer's requirements , specifications and fulfilling particular application. Industrial Disc Springs are conical shaped angular discs, that are loaded in direction of its axises. We bring these superior quality disc springs, procured by employing the latest technology, high grade machines and reliable raw materials. 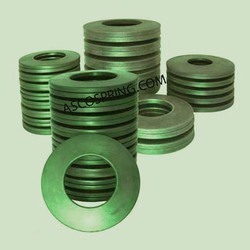 We are industry's leading Manufacturer and Exporter of Industrial Disc Springs. These springs are specifically used to solve many engineering problems like vibration, differential thermal expansion, relaxation, and bolt creep. These are designed and developed as per customer's requirements , specifications and fulfilling particular application. Disc springs can be used as both as single disc or discs arranged in stacks. Each stack can either comprise single spring or parallel spring sets. These can be available both with or without contact flats. We also present computerized designs to offer and assist our customers with detailed vision, specifications and applications. All our disc springs are produced using 50CrV4 material that is imported from our reliable and trustworthy sources. We manufacture these springs by utilizing the method of Austempering, a heating treatment, specially effective for springs giving them the required toughness and durability. Looking for Disc Springs ?